It's a wonder that this record ever came together - with Modeselektor playing so many shows in so many countries since the release of their last album "Hello Mum" almost exactly two years ago that its hard to fathom when they found the time to lay down these ambitious 18 (count 'em!) new tracks - including collaborations with Tikiman, TTC, Otto Von Schirach, Maximo Park, Puppetmastaz and, most impressively, Thom Yorke. And besides, strange things are gwan with Szary and Gernot, not content with doing pretty much everything else together they also just so happened to find out that both of their girlfriends were pregnant and due to give birth on almost the same day as each other in a few months time. Weird huh? So to celebrate the pair thought they'd christen this album "Happy Birthday", as some kind of momento for their as yet unborn little 'uns. Who knows, maybe they'll google their geriatric parents one day and come across this review. Ok Ok, this is now messing with my mind totally, and in fear of causing another rift in the space-time continuum i'll duly shut my trap and concentrate on the job at hand, trying to make sense of the maverick productions and deconstructions in front of me. 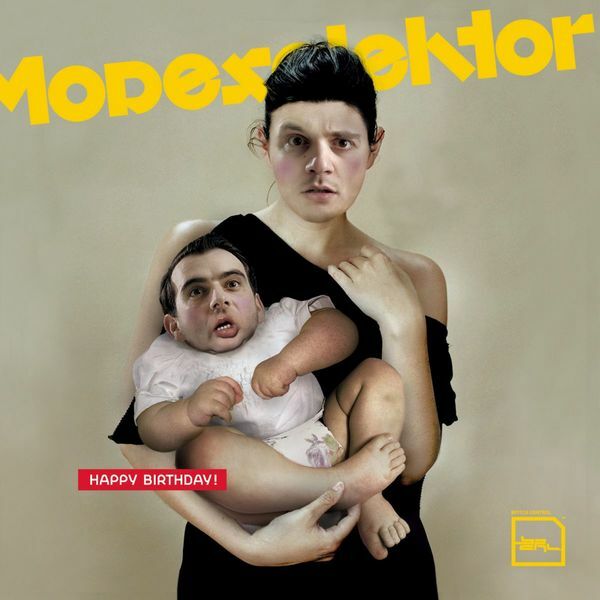 "Happy Birthday" is a gargantuan, sprawling affair, with a joyous, suitably silly narrative running throughout (punctuated by some all time classic Modeselektor images on the sleeve and the cd booklet). In fact, the only thing preventing this from becoming the novelty record it so easily could have been is the totally shocking production - Modeselektor's beats have just never sounded so good. There are really too many highlights here to mention - the fabulous collaboration with Apparat and Tikiman (first heard on the excellent De:Bug 100 cd), the Grime edits of "Hyper Hyper" (a Scooter cover-with shoutouts by Otto Von Schirach to Westbam and Carl Cox no less!) and, of course, the dubstep-fuelled Thom Yorke collaboration "The White Flash". It's the track that people will talk most about on the album and is already being heralded in some quarters as Dubstep's first real chance of crossover success. Whether or not that's the case we really couldn't say, but its nice and more than just a little heart-warming to see that after several years of mutual appreciation these three disparate artists have joined forces. Thom's delivery is simple and incredibly moving, with the refrain "You have all the time in the world.." offering perhaps the most effective food for thought on the album for the as yet unborn Modeselektor juniors. And with that lump to the throat, we'll leave you to it with a big recommendation for this excellent, hugely enjoyable new album from two of our favourite producers. Ever.